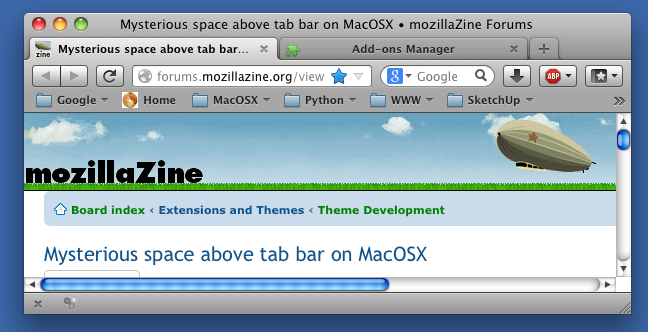 I'm trying to adapt the old MacFox 3 theme to work with a more recent Firefox on MacOSX. It's mostly working, but there is a 9 pixel gap between the bottom of the window title bar and the top of the tab bar. I've been poking around with the DOM inspector trying to find out where it's coming from, but there doesn't seem to be anything to account for it. Does anyone have any idea where it's coming from? It's not there in the default theme, or in some others that I've tried. I can get rid of it hackishly by giving the tab bar a top margin of -9 pixels, but I feel that I shouldn't have to do that. I'd rather do it the "right" way, whatever that is. Can you post a screen shot using the default theme and your under development theme? That way people can get an idea of what you are seeing. Another thing the default theme does, that I can't figure out how to do, is change the height of the window title bar. The grey background of the tab bar in the default theme is part of the title area, and I can drag the window around with it. But that doesn't happen with the unused area of the tab bar in my theme. The title bar doesn't seem to have a node in the DOM, so I can't apply any CSS to it, but something in the theme is obviously affecting it. I also tried my theme with Firefox 33, but it's even more messed up. The window title area is too skinny, and the tabs get clipped off. Again it seems I need to adjust the title bar height somehow. Is any of this stuff documented anywhere? All I seem to be able to find is outdated tutorials that go into very little depth. Also here's the theme file, in case anyone wants to poke around in it. The only changes I've made to the original MacFox 3 are in browser/browserTabBrowser.css. I just want to try and clear up what could be a point of confusion. You posted pictures of the Firefox 25 default theme, but you are posting with Firefox 33. For which version of Firefox are you trying to make this theme work? I'm concentrating on Firefox 25 at the moment, but I'd be interested in any information I can get relating to this for any relatively recent Firefox version. There's nothing particularly special about 25, it just happens to be the first version I tried between 4 and 33 where the theme mostly worked as it was.